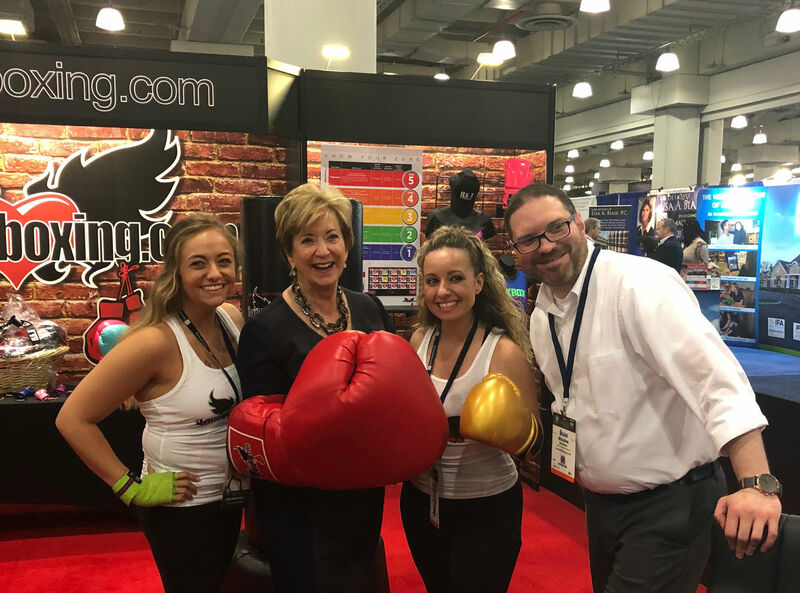 SBA's Linda McMahon stopped by the ILoveKickBoxing booth at last week's International Franchise Expo. Record attendance symbolizes that the entrepreneurial spirit is “thriving in America right now,” she said. The record attendance at the International Franchise Expo is a sign of optimism in the overall U.S. economy, SBA Administrator Linda McMahon noted when kicking off the event May 31 in New York City. 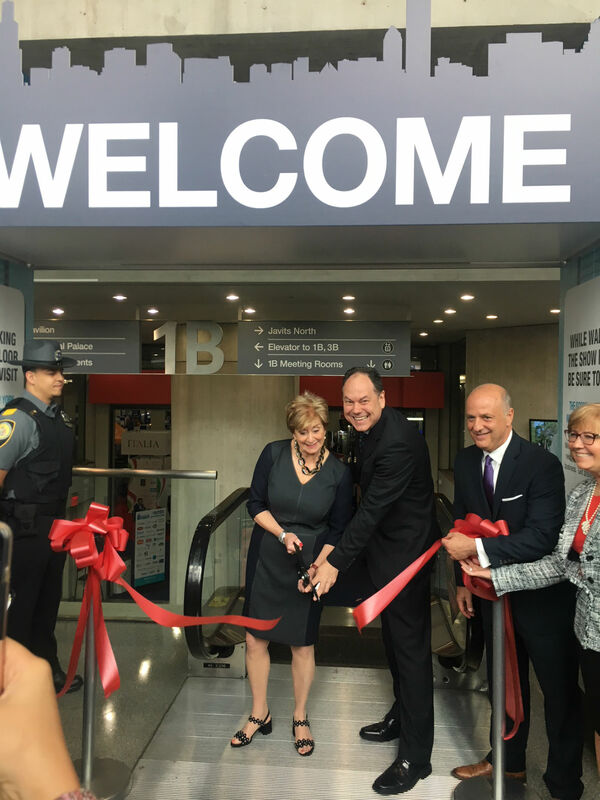 SBA Administrator Linda McMahon and IFA President and CEO Robert Cresanti, CFE, cut the ribbon to open the International Franchise Expo May 31 in New York City. The Expo, which is produced by MFV Expositions and sponsored by IFA with assistance from the U.S. Department of Commerce/U.S. Commercial Service, gave aspiring entrepreneurs the opportunity to talk with more than 400 franchise brands and learn more about franchising with 70 seminars and 10 workshops. McMahon, the former CEO of World Wrestling Entertainment who was appointed to President Trump’s cabinet as head of the Small Business Administration in February 2017, noted that now is a “terrific time for entrepreneurship.” The stock market has been in record high territory for over a year and the unemployment rate sits at the lowest level in 17 years, she said. Surveys done by various groups, including the U.S. Chamber of Commerce, CNBC, the National Federation of Independent Businesses, and the National Association of Manufacturers, report high levels of optimism. “From my perspective, there’s no better signal of small business optimism than entrepreneurs willing to take a risk by seeking funding,” McMahon said. Cresanti and McMahon (center) with franchise owners who participated in a roundtable discussion about SBA loans. IFA President and CEO Robert Cresanti, CFE, described McMahon as a “true champion of the business community.” He noted that franchise establishments are projected to grow 1.9 percent to 759,000 in 2018, with employment reaching 8.1 million workers and the sector’s gross domestic product increasing 6.1 percent to $451 billion, or about 3 percent of U.S. GDP. 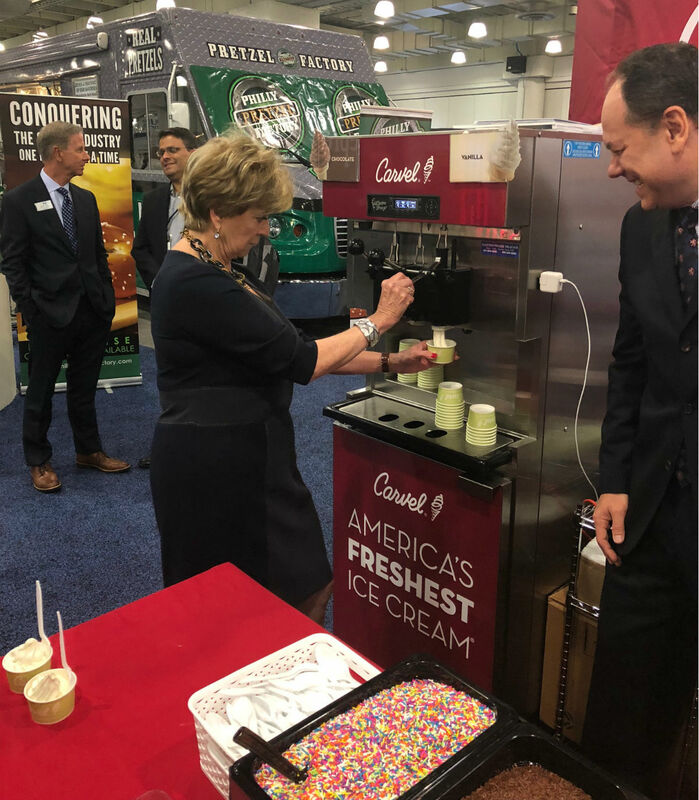 Linda McMahon toured the International Franchise Expo, stopping at a number of booths, including Carvel. McMahon participated in a roundtable discussion with franchise owners on SBA lending and the economic benefits of the newly-enacted tax law. Margaret Lewis, a roundtable participant and an iLoveKickBoxing franchise owner from Southington, Conn., said that opening a franchise was a great decision for her and her family, and the SBA loan was instrumental on her path to becoming a business owner. “I know firsthand that the franchise model can help provide good jobs and grow the economy,” Lewis said. Several franchise brands discussed the current labor shortage and the potential of summer jobs for teens in an interview with Fox and Friends. With a shortage of labor, Frutta Bowls, Club Pilates, Pet Supplies Plus, Experimac, and I Heart Mac and Cheese are hiring teens, providing an opportunity to develop skills from local business owners.